Room for a wide two way bike path if boats removed. See comments at end for latest updates on this project. The project was “shelved” in March 2018, and reported to the Councils Internal Ombudsman by the Mayor for investigation in Nov,2018, but a new consultant looks like being sought in 2019. 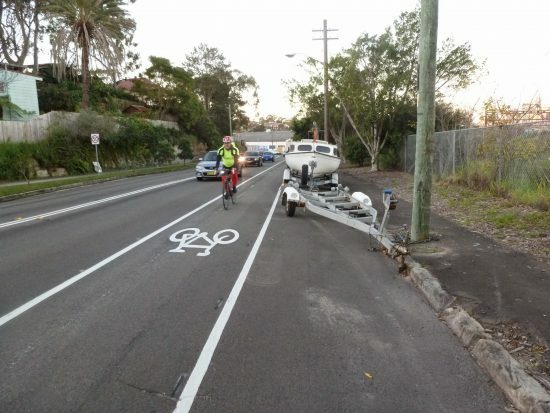 The revised plan for the Lilyfield Rd Cycleway was released in October 2017, after a year since the previous plan attracted a fair amount of criticism from residents about loss of parking and from cyclists about the narrowness of the path and other shortcomings. The Council budget had about $5 million dollars allocated to the project, most from the NSW Govt, and it is supposed to be a flag-ship “Regional Route”, attracting many new cyclists, and linking with Parramatta. The new plan had some interesting changes. The comments made interesting reading. Residents are complaining as usual about cycleways taking precious parking, but Council has come up with some innovative thinking to minimise parking loss. Parts of Lilyfield Rd have been made one way, and parking is to be removed only on the section from Gordon St to Justin St, east of Catherine St. This allows space for a two way bike path, their preferred design, or conventional bike lanes on both sides of the road, which many commuters might have preferred. The path has been widened to 3m in the one way sections, but remains 2.4 m between Balmain Rd and Justin St, where parking on the non residential (railway) side is to be retained, for reasons which are hard to fathom. We are saying the path needs to be 3 m consistently and that a two way path is too dangerous on the steep hill down to the Canal from James St. The existing uphill bike lane only treatment should be retained there. The Inner West Bicycle Coalition has made a submission, which can be seen on iwbc.org.au. There is a photo album too, showing the road as it is now and some of the issues that need addressing. Bike Leichhardt has worked with Leichhardt Council for many years to seek improvements for cyclists on Lilyfield Rd, so we are not opposed to the idea of a cycleway. But there are a number of problems with it as proposed and we are urging the new Inner West Council to address our criticisms. Note added 26 March 2018: After some 1500 comments on the plan, mostly negative, and mostly from non cycling residents concerned about parking or the proposed one way restrictions, Council has decided to “not proceed to design stage”. Instead they are going to have another go at coming up with revised “concept” plan. A public meeting is to be held on May 29, at Leichhardt Secondary College, Balmain Rd, at 6.30 pm. IWBC has written to all Councilors asking them to consider other routes, such as Allen St, or Francis/Allen, as alternatives to Lilyfield Rd. Not as direct, but easier gradients and also links to Norton St and schools etc better. Lilyfield Rd can remain as a fast commuter route for the more experienced and fitter cyclist, but it doesn’t require a two way separated bike path along it for that demographic. We are however still calling for safety improvements on Lilyfield Rd, like a 40 K speed limit and some of the less contentious parts of the plan, like removing all parking including the boat and trailer parking on non residential parts of the road (Justin to Gordon Sts), so there is an extra 3.5 m for cyclists. There were 1500 comments on the revised plan, most negative it appears, particularly from residents opposed to the one way restrictions proposed. The recommendation now going to the Traffic Committee, on 6/3/18, is “not to proceed to the design stage”. Instead they are recommending another round of investigations of the cycleway concept. This would include dropping the contentious no right turn into Lilyfield Rd, but making it one way west instead and investigating other unspecified ways to prevent rat running. They have given ground on the width issue, now saying they will seek to have a 3 m wide cyclepath “where possible”, and they have said they will look at bicycle phasing at Balmain Rd traffic lights instead of the cross over point near Edwards St. Also they say they will investigate how cyclists could use the road instead of the cycleway from James St to the Canal, but still retain the two way cycleway for those who wish to use it. Full details on the Traffic Committee agenda for 6/3/18 on the council website, under Supplementary Agenda. Big file, includes maps of the plan and all the comments by residents and others. Council is having another attempt at the cycleway. Tenders will be called soon for another consultant to review and investigate various options for the cycleway, including a “do nothing ” option, which would leave it much the same as now but fix a few danger spots, such as the inside bends near Ryan St and Rayner St, the Catherine St intersection, and maybe lowering the speed limit and tweaking the lane marking and more use of the BMUFL signs (Bikes May Use Full Lane). The additional “low stress” routes on Francis and Allen Sts we suggested will also be included in the review. The bi directional path down the steep hill to the Canal has been dropped, and they say they will try to get 3 m wide bi-directional paths elsewhere, where or if that design option is chosen. But there was still mention of some 2.5 m path, and they were cagey about removing any parking on the non residential section east of Balmain Rd, though they conceded residents were not strongly opposed to that. This time the consultation with residents and users will hopefully be extensive but quicker and better managed. The mayor and council need to engage with the residents and cyclists, promote the benefits of the cycleway and try to head off the usual strident opposition that seems to arise whenever a cycleway is proposed. The Mayor referred the previous project management to the Councils Independent Ombudsman, citing concerns that the money paid to the consultant GHDWoodhead (around $500,000) was wasted and that there was little to show. The Ombudsman said that it would need to go to an independent outside investigator (ie another consultant) – at Council expense. Council however approved the new tender process at its council meeting on 13 November, and the tender should go out soon for another go at getting improved cycle facilities on Lilyfield Rd. The work done by GHDW and Council prior to 2018 has at least shown what options wouldnt succeed, such as removing parking on residential parts and making sections one way, and, from cyclists, narrow paths on steep gradients, so should allow the new consultant to eliminate a number of designs. Getting bike lanes in anywhere around the world except countries like The Netherlands and Denmark seems to be a recipe for resident outcry, so early involvement and frequent meetings to thrash out problems as they arise is needed. Another complication is the Council’s decision to implement a boat and trailer ban on Lilyfield Rd east of Justin St, next to the railyard. This sounds good but will still allow cars and vans under 4.5 t GVM to park there, precluding use as a bike path (see photo at start of this page). The mayor said at the November council meeting that the decision would nt affect the possibility “some time in the future” that all parking might be banned for the cycleway, but in my opinion that will be difficult to achieve once residents and white van companies start using it as a convenient storage area.